What To Feed Your Dog . . .
That is what so many of us dog owners obsess about. And since most of our dogs like to eat so much, they obsess about it too. There are so many choices out there, that I think there are healthy options for every dog, owner and lifestyle. Whether you feed raw, dehydrated or kibble there is information available to help you make better decisions that will benefit you and your pet. I personally love feeding raw, however due to lifestyle changes I have had to make some adjustments. So my goal right now is to feed my dogs the best that I can. Here are some resources that I use on my quest. One of my favorite books out there is Natural Nutrition for Dogs and Cats by Kymthy Schultze. You can purchase this great little book for under $10 and it will get you started. And be sure to spend some time on Kymthy's web page. It is a wealth of information. You should also visit the blog Real Food for Dalmatians. Even though you may not have a Dal in the family this blog offers sound advice that applies to all dog breeds. My only complaint is that it is not updated more frequently. Be sure to go to The Honest Kitchen website, download their ebook and sign up for the newsletters. This is a amazing company that is willing to share information. If you have a pet with a health problem and need help, they have a nutritionist on staff and will give you the information that you need. No matter what you feed your dog, become a frequent visitor at Dog Food Advisor for information on all types of food, ratings, recalls. You will get up to date information from people that are more passionate and knowledge about food than anyone else I know! If you have any other great sources that I should add to my "go to" list, please let me know! This is what Pickles & Olivia had for dinner tonight, whole mackerel, tender carrots, green peas and pasta. Although it was a little more mushed up than the picture they really enjoyed Evanger's Whole Mackerel & Gravy. Although I am a raw feeder I keep an eye out for healthy "convenience" foods to use when I am traveling or running late on time. I have been so pleased with the Evangers foods that we have tried, that we are going to start selling them at Moe Toys. Pickles & Olivia really seem to enjoy the hand packed specialties, you can actually see what the food really is, so those will be the ones that we will have in the warehouse first. For dogs that are on a restricted diet, Evangers offers an entire line of game meats, including rabbit, pheasant and buffalo to name a few. If you have any special requests be sure to let us know! Canine Cuisine Class Was A Hit! My neighbor Deb and I had a great time and would attend the class again. The presentation by Elinor Silverstein is fun, informative and not only that she is smart. 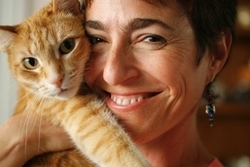 She has a bachelor's degree in science in both Biology and Zoology and has been cooking for her pets for over 30 years. The recipe that we made in class was for "Elinor's Delicious Doggy Meatloaf" and according to Pickles and Olivia, it was. We got to bring home samples for each of the dogs! Another recipe that was made in class was "Spring Drink Delight". Pickles and Olivia did not get to sample this one, but Deb and I did. It is very simple. You blend Blueberries, Mango and Fresh Ginger in a Blender. For humans you then put in a splash of green tea, and for the part that is going to be served to your dogs a splash of chicken broth. "Spring Drink Delight" will gently help detoxify the liver, and help boost you and your canine companions immune system. Looking For Something To Do And Are In Orange County???? Then join me at Whole Foods Market in Tustin for the Canine Cuisine Class this Wednesday, May 14th. It is 7-8:30, somewhere around the produce aisle. You will learn how to make your own pet food with local canine chef, Elinor Silverstein. This is a fun interactive class then head home with recipes and samples for your favorite pet, and best of all, it is FREE! Call the store for reservations. The phone number to the store is 714.566.7650, ask for the marketing department. Hope to see you there!! !